Home > Ask Our Experts > Which Fish go Together? Q.I was wondering if I could house these fish with a group of 4 peacock cichlids? (1 male, 4 females) Rams, chinese high fin banded sharks, parrots, plecos, kribensis, a redtail shark, angelfish, silver dollars, freshwater flounders, bronze corydoras and tiger barbs. If not which fish are the problem and what should I do? And if there are any other problems with this tank I would be glad to take fish out and relocate them. Peacock cichlids are generally gentle, sociable fish and a good choice for a community tank, especially when you have plenty of females to keep your male from getting jealous. However I do have some concerns about the aquarium set-up you propose. Ram cichlids are also gentlefish who rarely cause any trouble themselves, but they may find some of the other tankmates you propose here too boisterous. Parrot cichlids and tiger barbs may be so active as to make them feel intimidated, in which case they may not eat properly and they'llbe vulnerable to stress-related disease. They're best kept with other quiet fish. I'm afraid the Chinese high fin banded sharks are right out. These fish look very cute when they're small but they can grow to over two feet in length, so you simply can't keep them in a community tank with small fish, at least not in the long term. If you already have some and they're getting along okay just now, leave them there for the meantime, but be prepared to move them into a tank of their own (or with suitable other large fish) once they reach six or seven inches in length. There are two types of fish sold as parrot cichlids. The original South American variety, green with a darker stripe along its lateral line, isn't suitable for a community tank like this, as it grows far too big. However, the small rounded fish you're more likely to find in your local fish shop, in a variety of colours, don't get too big and are generally good community fish. Plecos vary greatly by species, so you'll need to make sure that the ones you choose are smaller (no more than eight inches in adulthood), but if this is the case then they should be suitable tankmates. You shouldn't have any problems with kribensis, silver dollars, bronze corydoras, or a (single) redtail shark, though it's a good idea to provide them with hiding places. Angelfish should get on with your peacocks but may be a problem for some of the smaller tankmates you've proposed, such as the kribensis. Watch them carefully to make sure they're not bullying and/or nipping fins. Freshwater founders are generally friendly fish but, despite their name, they're much healthier if kept in a brackish aquarium, so I wouldn't recommend them in this instance. Tiger barbs should be fine with your peacocks and most of the other fish proposed here, provided that you keep at least six of them so that they feel secure (two males and four females is ideal), but it's generally not a good idea to keep them with angelfish, as they have a tendency to nip their long, trailing fins. An aquarium suitable for this mix of fish should be kept at a pH between 6.8 and 7.2, with a temperature of around 24ºC. Maximum Temperature for a Biorb Tank? My Blue Shark Seems to Panic: What Can I Do? My Pet Fish is 20 Years Old is this a Record? How do I Care for my Chilid Fish? please tell me,can i put 2 angles with my male betta in my chi 6lt tank.gordon k.
@Stevo, we have a full article on how best to care for baby fish. It's under the category 'tips' and it's called 'Caring For Baby Fish'. Good Luck! I have a large tank that I have had for 4 years. 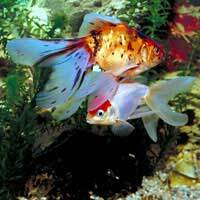 I have two large parrott fish, a red tail shark, did have 2 torpedoes but one died yesterday, I also have some algie eaters and one of them has died too. My water quality is the same as I have tested it, but I put a large upside down catfish in two weeks ago, would he have anything to do with me losing my fish. I'm just starting up a tropical fish aquarium i've got a 60 litre tank put a filter,heater and airpump in been told to leave it for 3 weeks before adding fish will make sure the water is tested! Just wondering what the best fish to start with would like a bit of colour and like the idea of having some bottom feeders that will clean up the algae! Very much a novice so would appreciate some advice been told I need some hardy fish to start with probably introduce about 4 any help would be greatly appreciated! i just wanted to make sure that i could keep 5 silver dollers in a 55 gallon and wat other tank mates could i have. I'm trying to place a schoolmaster snapper in my tank can. It's about 3-4 inches and I have a tank with koi and a tank with mudfish and fiddler crabs? Can it go in one or do I need another tank? Please tell me if it is safe to keep a Japanese Fighter in the same tank with Guppies Neons and Platties?